California Highway Patrol Capt. Adam Jager holds a machete similar to the one officials say a 17-year-old suspect used to attack an officer yesterday, leading to a fatal shooting. Update one: The Humboldt County Coroner's Office has released the name of the person killed: Hoopa tribal member Richard Fredrick Tis Mil Estrada, 17, of Hoopa. Update two: The California Highway Patrol says the officer involved in this incident, Tim Gray, was discharged from U.C. Davis Medical Center today. It was a surprise machete attack that began the deadly altercation between a California Highway Patrol officer and a Hoopa teenager near Willow Creek early yesterday morning, said CHP Capt. Adam Jager, who heads the agency’s Humboldt office. During a press conference this afternoon, Jager said the officer responded to a report of a car that had crashed into a light pole just east of Willow Creek at about 1:35 a.m. to find a 17-year-old driver sitting behind the wheel of a Nissan sedan. The officer made contact with the driver, who then exited the vehicle, Jager said. The two then walked around to the rear of the vehicle, Jager said, when, all of a sudden, the teenager attacked the officer with a machete. 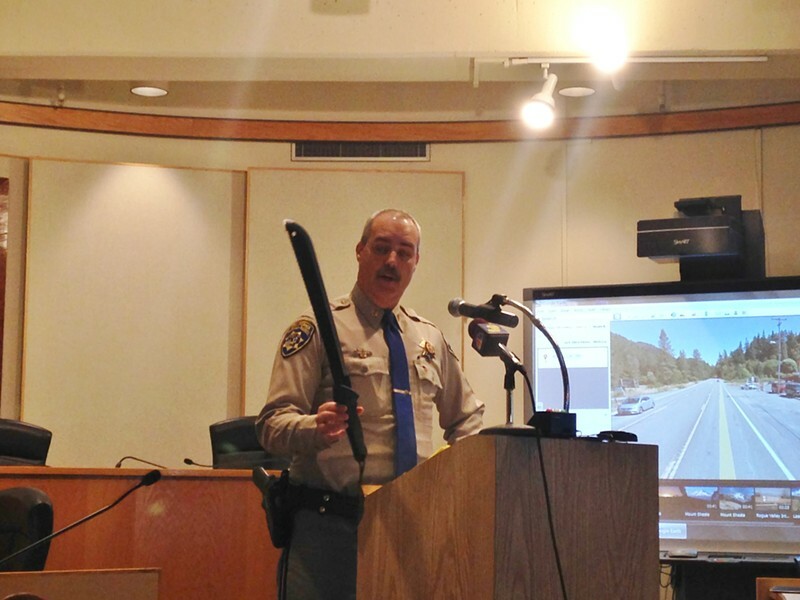 Officials say a 17-year-old from Hoopa used a machete similar to this one to attack a California Highway Patrol officer early yesterday morning. The officer fatally shot the teenager. Jager said the officer — who’s been with CHP for two years — then drew and fired his weapon as he went down. Jager declined to say how many times the officer shot or how many bullets hit his assailant, citing the ongoing multiagency investigation into the incident. The officer, Jager said, was able to “miraculously” keep his composure and balance enough to retreat back to his patrol car, at which point he locked himself inside and radioed for help. Witnesses later told investigators that the juvenile then got back in the driver’s seat of the Nissan and began honking his horn, according to Jager. When a backup officer arrived on scene, Jager said, he found the juvenile lying completely naked on the ground beside the Nissan, acting erratically. The officer ordered the juvenile to put his hands behind his back but he didn’t comply, Jager said, and the officer Tasered him. Ultimately, Jager said, two good Samaritans came to the officer’s assistance, helping him handcuff the juvenile. At that point, the officer and responding paramedics began CPR. A short time later, the teenager was pronounced dead at the scene. Meanwhile, Jager said, the injured officer was transported by ambulance to Mad River Community Hospital and later flown to University of California Davis for further treatment due to the severity of his injuries. Jager declined to detail the officer’s injuries, but said repeatedly that they are “very serious.” The officer remains hospitalized in stable condition. Humboldt County Sheriff Mike Downey said his office is leading the Critical Incident Response Team investigation into the shooting, but declined to get into details at the press conference, which took place just a little more than 36 hours after the shooting. The sheriff described the situation as fluid and fresh, adding that investigators haven’t even been able to get a statement from the injured officer at this point. Jager said witnesses told investigators that the juvenile was acting erratically after the accident but prior to the officer’s arrival on scene, throwing things from his vehicle. The captain said it’s unclear when and how the machete came into the picture — whether the juvenile had it concealed during his initial contact with the officer or pulled it from somewhere. 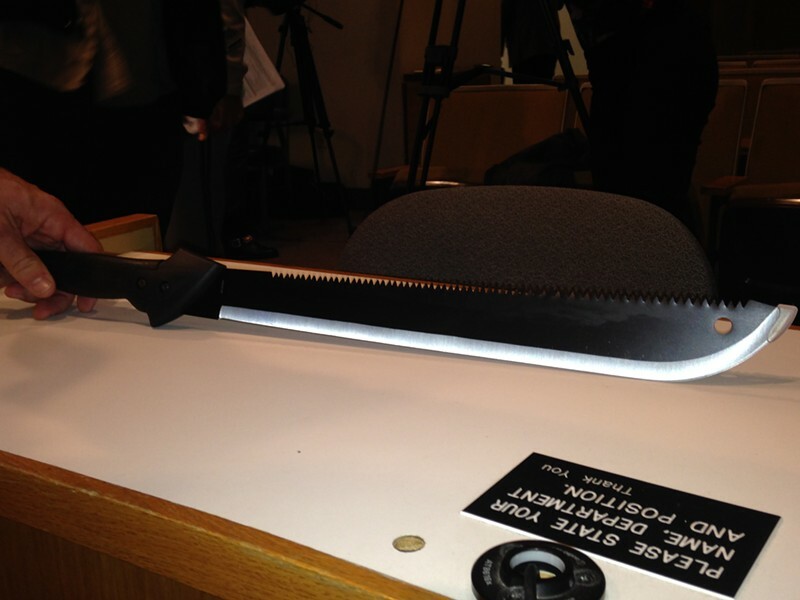 “We’re not sure, because it happened so fast, where that machete came from,” he said. Officials are withholding the injured officer’s name at this point, saying they want to give him some time and privacy, but pledged to release it in the near future. The juvenile’s name has also not yet been released. Jager said the injured officer has been with CHP for two years, but only transferred from the San Francisco Bay Area to Humboldt on Dec. 2 to become the area’s resident officer in Willow Creek as part of a program designed to bring CHP officers and the communities they serve closer together.